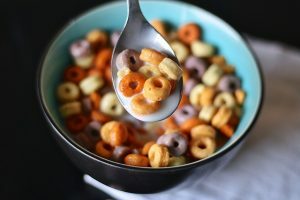 With all the talk in the press over the last few weeks about how bad so many cereals are for our children’s health, I thought it would be great time to really focus on what we’re feeding our kids first thing in the morning and what effect this all-important first meal of the day has over the next few hours. 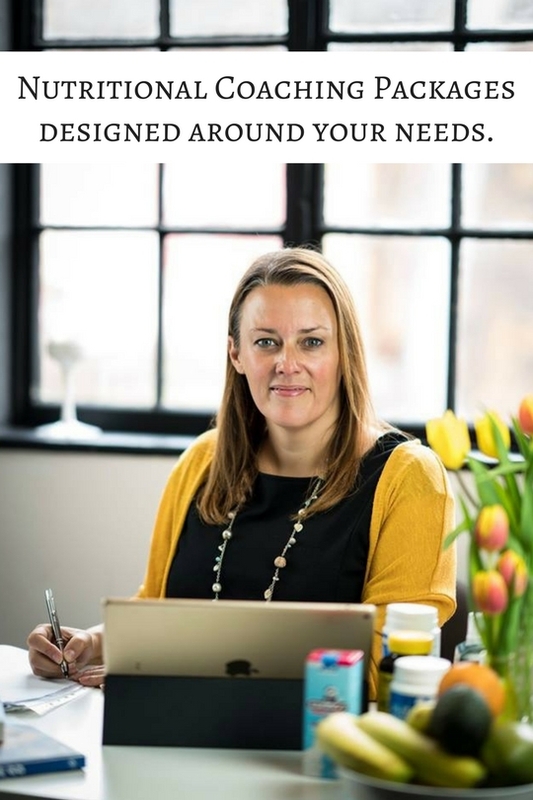 I know mornings can be a rush when you’re trying to get out the door with kids, but I really want to encourage you away from breakfast cereals or toast and jam. We invest so much of our time in our kids, their education, their extra curricular activities, emotional support. Yet if we put a bit more time into a decent breakfast, they could even do better at school, feel more emotionally balanced and thrive even more. After a good nights sleep, our body craves slow releasing energy to keep us full until lunchtime. A sugary cereal or toast and jam will give them an instant energy boost, but it won’t keep them at their best until lunchtime. And after all, most parents just want their kids to be the best they can be. Protein and fibre will help to keep your kids feeling fuller for longer, preventing them from having blood sugar peaks and crashes. Protein rich foods also tend to be higher in B vitamins, which are vital for brain health and learning. Here are some ideas you can use on a daily basis. In most cases, a mound of children’s sugary cereal, thrown in a bowl, and splashed with milk is the quickest and easiest option to get the kids fed and off to school in a flash. However, even breakfast cereals that seem healthy, such as granola or muesli, are mostly packed with sugar and salt, and often high in saturated fat. Remember one teaspoon of sugar is 5g, so look for a cereal with less than 1.5 tsps of sugar and less than 1g of salt. Now this can be tricky because the majority fall into the unhealthy category! Homemade muesli – made with quinoa flakes, oats, rye flakes, buckwheat flakes, lots of nuts and seeds and just 1 teaspoon of dried fruit per portion. Cereals labelled as paleo tend to be lower in sugar. Or anything made with buckwheat or brown rice… but probably best to still add a little more protein to these such as nuts or seeds. Chocolate rice puffs… you know the monkey ones! Cereal bars are an even faster option, but they too contain heaps of hidden sugar! Even though this ‘grab-and-go’ breakfast will give your children a massive energy kick to begin with, they will be unable to maintain their energy levels, meaning they are more likely to crave more sugar by mid-morning. Another super-speedy breakfast option to avoid is Pop Tarts. I’m a mum as well as a Nutritional Therapist and I find it difficult to understand how these can be described as ‘breakfast’ when they are nothing more than a sugar-filled dessert! Pop Tarts are a sweet pastry product, high in sugar, high in empty calories, devoid of nutrition and will not sustain your children’s energy levels, meaning they will be hungry again within an hour or two! White toast with chocolate spread is another bad-breakfast favourite… White bread is high in carbohydrates and can spike your sugar levels; twinned with the high sugar content in chocolate spread, this refined carb and chocolate combination will be harmful to your teeth and gut if eaten on a regular basis. Despite the health claims made by the manufacturers of these chocolate spreads, a visual breakdown of what they really contain reveals their true nature. Yuk. Last but certainly not least is the traditional fry up! Even though some of its ingredients are considered healthy (i.e. eggs, tomatoes, and mushrooms), they are usually fried in lots of oil, making it an extremely fatty and cholesterol-filled meal. But you can make a cooked breakfast super healthy… see below! We need to beware, as these bad breakfasts can be extremely bad for our children and us, eventually leading to long-term negative impacts on our health! So, maybe as the school break is upon us, you could try these good ‘healthier’ options instead? Twinned with whole wheat toast, which has less calories and salt than traditional white bread, this makes a super yummy, but equally healthy, indulgent breakfast! Chop up a piece of fruit on the side to get one of their 7 a day too… even better! When kids hear the word ‘green’ concerning food, this sometimes sparks alarm bells as being boring or disgusting! However, this tasty smoothie is totally the opposite to this, with some amazing flavours of lemon and ginger. I get my children to drink theirs by telling that that it’s ‘Hulk Juice’ that will make them strong! Which, actually, isn’t that far from the truth at all! 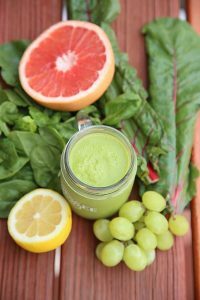 This refreshing green smoothie is packed with vitamin K which as well as playing a key role in helping blood to clot, is critical in preventing certain age-related conditions and B vitamins which help convert the carbs in food to glucose that the body can use as a fuel to produce energy. The green leaves in this smoothie are high in ant oxidants and low in cholesterol, which will help to preserve vision health and boost bone strength too! This smoothie is perfect for kids who don’t like to eat breakfast or even to accompany another of these breakfast options. Place all your ingredients in a blender or NutriBullet. Blitz and drink straight away. Eat a handful of your favourite nuts to add a bit of ‘bite’ to this nutritious breakfast! So, we already know that eggs are extremely good for our children due to the proteins, vitamins, minerals, and good fats they contain. 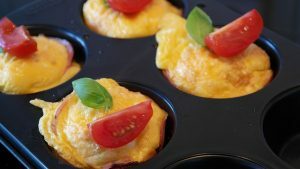 Dip some kitchen roll into the olive oil, and wipe inside the muffin trays. Line each muffin tray with the slices of ham, and drop the chopped cooked vegetables into the bottom. Beat your eggs with the quark. Add the freshly ground pepper, turmeric and chives. Pour the egg mixture into the muffin trays. Bake at about 180C for about 15 minutes, until the muffins have risen and the tops are golden. Allow to cool for a few minutes before turning out. Store in a sealed container in the fridge for up to 3 days. For those with a sweet tooth, this recipe is perfect and still really healthy! Bananas contain high levels of tryptophan, which is converted into serotonin (which is the happy-mood brain neurotransmitter, so puts you in a good mood!) They also pack an energy punch by sustaining your blood sugar, counteracting calcium loss and helping to build strong bones. Bananas have even more health benefits due to their high levels of vitamin B-6; important for energy production and helping your body to manage stress. B6 can also help with the production of white blood cells, thus helping our bodies to fight off nasty illnesses! Your children will love the creamy ‘pudding-like’ consistency of this delicious breakfast. There’s nothing like serving up something which looks like a dessert for breakfast! Slow releasing oats will keep them fuller for longer, whilst the fruit and a cinnamon add a more saintly sweetness. 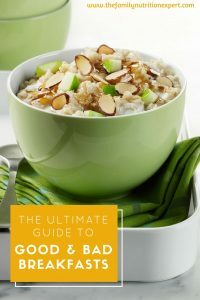 Soak overnight half cup of oats (or mix of oats, quinoa flakes, buckwheat flakes) in 1 cup of oat, coconut or unsweetened almond milk, with half teaspoon cinnamon. Garnish with some flaked almonds on top. Yummy! For more healthy breakfast recipes download my free ebook: Junk Food to Super Food! Just pop your email in the box below and it will be with you in minutes!